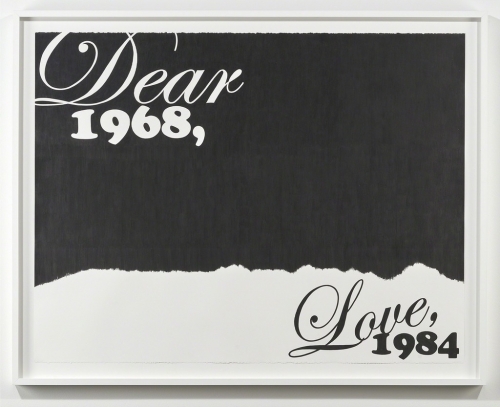 Sadie Barnette’s powerful traveling exhibition “Dear 1968,…” opened at the Museum of Contemporary Art San Diego on April 19th, its third institutional stop. The work here centers on a collection of archival documents, which are both political and deeply intimate: Barnette’s father’s FBI file, a record of surveillance conducted after he founded the Compton chapter of the Black Panther Party in the late 1960s. A recent show of the artist’s work at Fort Gansevoort in New York explored similar themes in Barnette’s distinctive graphic style, combining photography, drawing, and text. Barnette was included in a host of group shows across the U.S. in 2017—from the Museum of Contemporary Art Detroit to the California African American Museum in Los Angeles—suggesting that her work has extra resonance in this time of cultural and social upheaval. She was also a highlight of last year’s “Excerpt” at the Studio Museum in Harlem, an institution where she previously was an artist-in-residence.